Now that the golf season has begun, for safety reasons, please no walking on the golf course. Only golf club members and the golf course crew are permitted on the course during the open season. Lost Watch: A ladies Seiko watch. If found please call 613-692-2402. This entry was posted in Public Service Notice. CGHYA has received several reports of coyotes in the neighbourhood. The most upsetting news was a resident reporting to us that their dog was killed by coyotes a few weeks ago. Coyotes are most frequently seen and heard during mating season (January-March) and when juveniles start leaving the family pack (September-November). Although sightings are not unusual, especially in residential areas bordering on open space, this is a gentle reminder to not leave pets unattended, especially at night. Coyotes are naturally timid animals and will usually flee at the sight of a human, but any aggressive behavior should be reported to the local police and/or animal control officer. To reach Ottawa animal control dial 3-1-1. CGYHA and Councillor Moffatt are asking boaters to please recognize the high waters right now and to please keep your boat speeds low so they don’t cause large wakes. The shorelines are already flooded from this week’s rain and large wakes are causing substantial damage to shorelines as well as private property, structures and docks. Please be cognizant of the issues this can cause residents living on the shoreline. We appreciate everyone’s cooperation in this matter. The CGYHA executive committee is losing a valuable member of its executive team. Robert Weiss, the Vice-President is leaving the community, so will no longer be able to serve. We would like to reach out to residents for a volunteer who might be interested in filling the VP position. The duties required are outlined in the Constitution which can be found here on the website. Thank you to Robert Weiss for his years of service and dedication to the community! If you are interested in filling the position or would like more information, please contact us by email at cgyha@outlook.com. RIDEAU VALLEY WATERSHED, Thursday, June 15, 2017 — Recent high waters have caused erosion damage and damage to shoreline structures, particularly east of Cumberland along the Ottawa River and in the upper reaches (Tay Valley Watershed) of the Rideau Valley Watershed. The Rideau Valley Conservation Authority (RVCA) recognizes that some of the remedies for damage may need more than just a minor “tweak”. This is a reminder to all landowners to check with your local Conservation Authority to see if approval is required prior to doing any “clean-up” work along your shoreline (e.g., shoreline stabilization or repair to shore works, erosion control, dock construction, etc.). There are also restrictions to when you can undertake in-water work and possibly other approval agencies that require consulting depending on where you are in the watershed (e.g., Parks Canada and Ministry of Natural Resources and Forests). The best thing to do is contact your local Conservation Authority to see if there are any restrictions or approval requirements. In the Rideau Watershed, call the RVCA’s Resource Specialists at 613-692-3571 or 1-800-267-3504 ext. 1128 and 1132. You can also visit the RVCA website at http://www.rvca.ca and look for the “After the Flood” link. Be sure to read the document entitled Guidelines for Shore Works in the Rideau Valley Watershed to help you with your project. In cases of severe erosion, funding may be available through Rural Clean Water Grants. RVCA Resource Specialists can guide you towards next steps required to make application to receive funding. Information on these grants is also available on the RVCA website. The riparian zone (the area along the shores of our creeks, rivers and lakes) is an important area for wildlife and water quality. Trees and shrubs along the riparian zone provide a vegetative buffer that provides shelter and food for wildlife while intercepting upland nutrients. Trees and shrubs also provide valuable erosion protection. They are extremely resilient. Don’t be too quick to remove shoreline plants. Instead, give damaged plants the opportunity to respond with natural regrowth. Corrective pruning may suffice. If you are interested in naturalizing your shoreline, contact the RVCA for details on their Shoreline Naturalization Program or visit the website. Waterfront property owners will want to remove any fallen branches and debris from their shoreline to ensure the unaltered and uninterrupted flow of water. Be sure not to dispose of garbage, debris or sandbags in the river. Check with your local municipality for local disposal options. 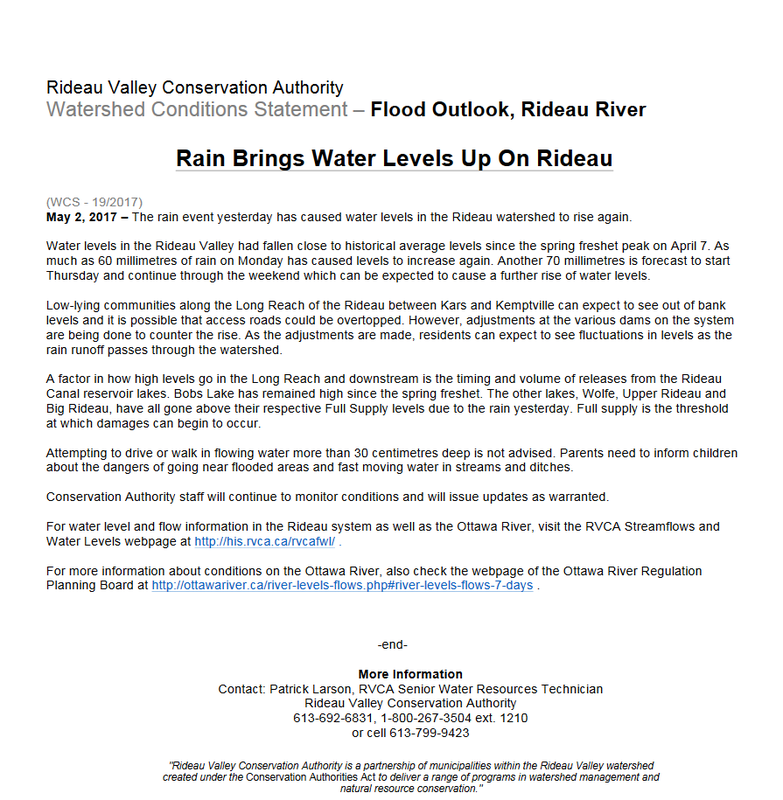 Rideau Valley Conservation Authority issued a statement on expected water levels through the weekend. To learn more visit their website.